House crickets are closely related to the Grasshoppers and locusts, and like them they have the hind legs which are modified for jumping ( In crickets, the tympanum (ear) is located on the tibia of the hind legs). The adults are about 2 cm long, and pale brown with a black pattern on the head and thorax. They have two pairs of wings of which only the back pair are for flying. At one time house crickets were associated with bakeries, but this is no longer so. Nowadays they are more likely to be found in warm ducts and in paneling behind heating installations, quite frequently in breweries. Another way that house crickets get into domestic premises is when the occupants keep exotic pets such as tarantulas and lizards. These types of pets have to be fed live food and the poor old house cricket is the answer, however, if the owner isn't careful the live food tend to make a getaway........and disappear over the horizon, not really, they usually get under the floorboards and drive the occupants mad with their chirping. House crickets often occur in new buildings and this is probably because such places provide good shelter and food, and half finished houses are easy to enter. It is also possible that these insects may, in some cases, be brought in with the building materials or packaging. In northern Europe house crickets do not normally survive outside during the winter and most of them come indoors at this time. However, they can survive throughout the year, and will sometimes multiply in enormous numbers on refuse tips where decomposing waste is producing quite high amounts of heat (see below). The abdomen of female crickets ends in a long narrow structure, the ovipositor, which allows them to lay eggs in the ground. 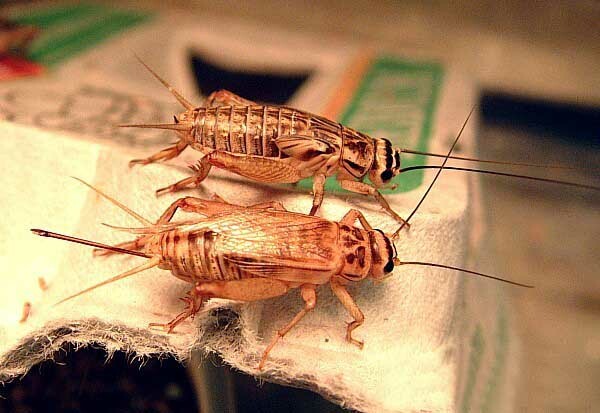 House crickets take two to three months to complete their life cycle when reared at 80 to 90° F. Eggs are deposited in whatever damp substrate is provided  for example, sand or peat moss. Juveniles resemble the adults except for being smaller and wingless. . Each female will lay between 50 to 100 eggs that hatch in about two to three weeks (Incomplete metamorphism). Newly hatched nymphs are the same size as the eggs, and blend in with their surroundings. Adult crickets will eat their own young (cannibalism). Also, it is normal for some adults to die naturally after mating. The remaining eggs will continue to hatch for 10 to 15 days. As is the case with other orthopterans, when crickets first hatch they already look much like adults (nymphs), except that their wings and genital organs are not yet developed. It takes these tiny crickets eight to twelve weeks to reach full maturity. 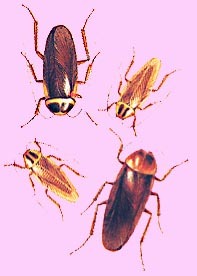 Adult crickets generally live two to three months. 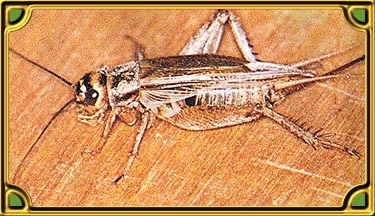 Crickets need warm temperatures of at least 80°F. Nymphs held at 80°F require up to 60 to 65 days to mature, while those held at 90°F require only 30 to 35 days to complete development. They have a characteristic chirping noise.........boy..!! do they chirp, the sound has been likened to that of new born chicks. In former times the cricket on the hearth was a familiar 'domestic' animal and a well known character in many stories and fables. It is only the male cricket that sings that sings and he does so to attract the females. Each male sits in his own little territory and sings. When they stridulate, or chirp, crickets rub the teeth on the sharp edge of one wing against a particularly thick and rough scraper on the opposite wing, using it as a bow. As the temperatures rises, crickets' songs become louder and faster. With some species, it is possible to precisely determine the temperature simply by calculating the frequency of their chirps. The male also has a sharp aggressive piping note, which is heard when another male tries to enter its territory. A love sick cricket may sing for hours at a time, as some people will have heard to their cost. One zoologist found that a single cricket chirped no less than 42,000 times over a period of four hours. In aancient China the chirping was so highly regarded that the ladies of the Imperial Palace kept crickets in small golden cages on their pillows, so that they might fall asleep to the song.